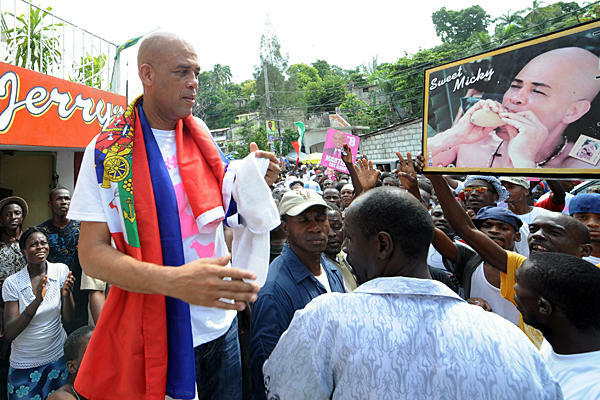 SANTO DOMINGO, Sept. 22 (Xinhua) — Haitian President Michel Martelly Monday launched new consultations to resolve the political deadlock that has delayed parliament elections, said reports from the Haitian capital of Port-au-Prince. “Working to keep the flame of hope and dialogue alive is a historic necessity. Building the future of Haiti requires pooling our resources, with no exceptions,” Martelly posted on his Twitter account. Martelly met Monday with representatives of civil groups, including Rony Desroches, president of the Civil Society Initiative (ISC), and Edouard Paultre, president of Haiti’s Association of Non-Labeled Actors. Martelly announced earlier this month his intention to meet with opposition leaders, as part of a new push to break the political deadlock that has delayed legislative and local elections for about four years. Martelly’s new round of closed-door meetings are to also include activist Sauveur Pierre Etienne, president of the Organization of People in Struggle, parliament members and the president of the Supreme Council of Judicial Power. Disagreements between the government and the opposition of Haiti have prevented the election of 20 senators, 112 deputies, 140 city officials and 1,140 assembly members and community representatives. The U.S. embassy in Haiti last week called for dialogue to end the political crisis, while the UN Stabilization Mission in Haiti (MINUSTAH), which oversees the reconstruction effort in Haiti, said it was “disappointed” by the constant electoral delays. In January 2015, another third of the Senate members and the entire Chamber of Deputies will conclude their terms, leaving a legislative vacuum if elections were not held by the end of this year.